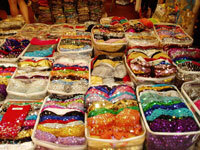 If fashion is a chameleon, then Wufenpu garment market is its sprawling habitat. 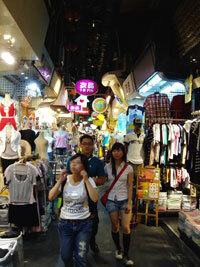 Wufenpu, located opposite Songshan train station in XinYi District, is one of the largest clothing markets in Taipei. The heart of Wufenpu beats with the latest fashion trends at some of the lowest prices in Taipei, pumping shoppers through its overflowing veins of more than 100 stores. Although the market caters mainly to wholesalers, individual shoppers are bound to find bargains to their liking as well. Wufenpu literally means "five pieces of land," a name acquired when the first Chinese settlers divided a plot of land into five portions. Today, the area is a magnet for bargain seekers and vendors, who stock up on goods that are later sold at night markets and stores around Taiwan. 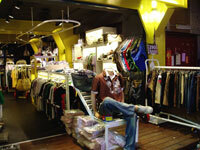 The Wufenpu network of streets brims with shops selling quality clothing at inexpensive prices. 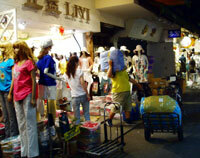 The market, known officially as the Wufenpu Garment Wholesale Area, begins near the intersection of YongJi Road and ZhongPo North Road and snakes up to RaoHe Street. Wufenpu stocks a range of garments that caters to all ages, particularly women's clothing and kids' wear. Part of the market's popularity lies in its keeping up to date with the changing trends in the fickle world of fashion, whether it is the comeback of retro chic or the explosion of bold prints. Although teenage clothing is omnipresent in these streets, the market also stocks niche fashion, including extra-large sizes and traditional garments. Besides being a treasure trove of the latest styles, Wufenpu is also an Aladdin's cave of accessories and jewelry. Although the market is definitely not a high-fashion zone, it offers the latest street fashions for a fraction of the cost found elsewhere, with many items priced at less than NT$500. Bulk buying generally yields a discount. The best way to get to Wufenpu is by MRT. Take the Bannan line to Houshanpi station and go out Exit 4. The market is a five-minute walk from the station along YongJi Road.